Prague Castle From The Charles Bridge.by Jim Linwood. Image licensed under Creative Commons Attribution-NoDerivs 2.0 Generic license. The city has undergone a face-lift, after decades of lamentable neglect, presumably to help pack in the tourists. The effects are impressive. Prague has an abundance of old buildings, ornately adorned, brightly painted, more Viennese than Vienna itself. And the concrete block monstrosities that blight the landscape of many eastern European cities are fortunately out of sight in central Prague, relegated to the southern side of the city. Prague had the first university in Mitteleuropa, founded in 1348 by scholars escaping from plague-infested Italy and named Charles University for Charles IV, king of Germany and king of Bohemia. Not surprisingly, faculty and students organized themselves right from the start into four so-called nations- Czech, Saxon, Bavarian, and Polish. The present university still occupies the original site (the Carolinum on Zelezna Street), but there is little left to remind one of its origins or former national divisions. The great days for science here were the days of Tycho Brahe and Johannes Kepler (around 1600), which culminated in the publication of the Rudolphine Tables of astronomical positions. Remains of the old summer palace, which King Rudolph gave to his astronomers for a residence and observatory, were unearthed in the 1950s in the courtyard of a modem school (now called the Jana Kaplera Gymnasium). Brahe and Kepler are commemorated by a plaque and by a marvellous statue of the two of them, standing side by side, their facial expressions and body stance defiant, suggesting that they may be about to start a duel with some opponent of their work. The site (corner of Parlerova and Keplerova streets) is high up on the Hradcany hill, even higher than the castle itself, quite appropriate for a former observatory. 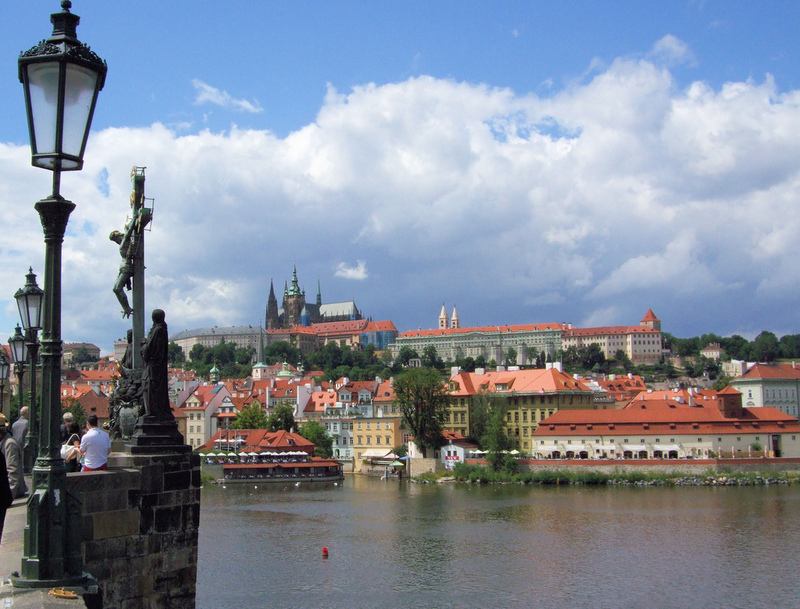 It is a somewhat strenuous climb from the turreted Charles Bridge across the river below. Tycho Brahe is buried in the historic church of Our Lady, on the Old Town Square. An impressive memorial tablet stands just beyond the new altar railing on the right side of the nave and the actual tombstone is just below it. Kepler outlived Brahe by 30 years and left Prague after King Rudolph died. A plaque marks the house where he lived from 1609 to 1612, at 4 Karlova, across the street from the Clementinum, a former Jesuit college.